This is a program that samples international strategies of re-thinking city living, reclaiming territories, negotiating urban spaces, and perceiving the relationships they create. 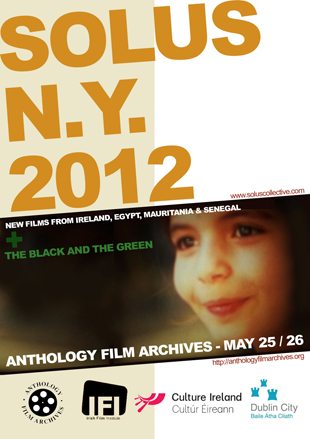 The show includes films from Egypt, Ireland, Mauritania, Senegal, and the U.S., including an Irish-Mauritania co-production (the first ever, to our knowledge!). Special mention goes to the Maison des Cinéastes in Nouakchott, Mauritania (www.lamaisondescineastes.org), and to our friends in Alexandria, Egypt, whose online videos kept us up-to-date during the recent, fantastic Arab Spring. The first four of these films were shot during Super-8mm workshops given by the Film Flamme association in Marseille and by Moira Tierney in Dublin, Fermanagh, and Toulouse. The children were at total liberty to proceed as they desired; adult input consisted of technical support and post-production (the films were primarily edited in-camera; post production consisted of assembling the images and sound according to the childrens’ instructions). The fifth film was shot by children in the Gaeltacht (Irish-speaking area) of County Cork, Ireland, during a workshop led by Donal Ó’Céilleachair. Reverend Daughtry and Sandy Boyer, both of whom are featured in the film, will be here in person for the screening! Featuring work by Egyptian, Irish, Mauritanian & Senegalese film-makers. Two of the participating Irish filmmakers, Ronan Coyle and Peter Foott, will be attending. French & Irish children's workshop films. 8.00pm THE BLACK AND THE GREEN by St. Clair Bourne / post screening discussion with reverend Herbert Daughtry & Sandy Boyer.